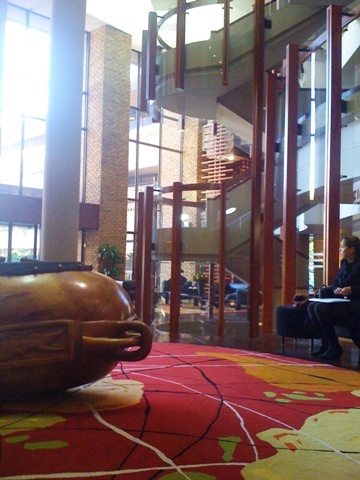 You just wonder: How many of those huts above could you build for the cost of that one wooden piece of art I was staring at in the SAB lobby? Such was the contrast between rags and riches, all in the space of one morning. Only we didn’t actually secure any riches. Instead, we dropped off proposals with secretaries who promised they’d show them to their bosses. I’m a bit dubious if this will lead to anything and didn’t quite like the inefficiency of it, but Tedius and Cedric insisted a personal appearance was preferable and I can’t claim that I’ve made any more progress via phone and email. At first I didn’t actually see the need for me to tag along, but this soon became apparent. When you come from Alexandra and have no appointment, no one wants to talk to you. My purpose was to lend some white-skinned and eloquent respectability to the team. Though I’m not sure that I made much of an impression, I might have gotten us past the doorman. What I learned is that things move slow in Africa, but even slooooooower when you’re asking anybody for money. The task is daunting: Large corporations like SAB have tons of money they already spend on outreach and community development (Tedius tells me they’re South Africa’s largest taxpayer and I don’t doubt it) so you’d think they’d be quite willing to spend some of it on us, but they’re already very entrenched with their existing programs and not all that interested in starting something new. Small companies, on the other hand, don’t have that kind of money in the first place and therefore are even harder to convince. What you need is good connections, and as a newbie here in South Africa I’m a bit short on those. I read the other day that some U.S. billionaire bough a ragtag soccer club in England which is now flush in money and the envy of their league. So, if you have any extra cash for this type of thing or know anyone who does, we’ve got a baseball club here for sale! Tedius and Cedric have worked out a detailed proposal with different levels of sponsorship and what kind of advertising that buys you. I can guarantee you that they’re open to negotiations for your very own customized package, and I a can also guarantee you that you don’t even have to be a billionaire. We are one very affordable baseball club! Seriously, let me just explain again why we’re looking for sponsors. When a kid in a “normal” middle-class place becomes a member of a sports club, his membership comes with a lot of basics that we’ve all learned to take for granted. His parents buy him whatever equipment is needed, he gets the use of a more or less nice field, a dedicated coach, and unlimited transport. He also shows up at a game well-fed. Oh, and the league he plays in has probably already been set up and running for years. 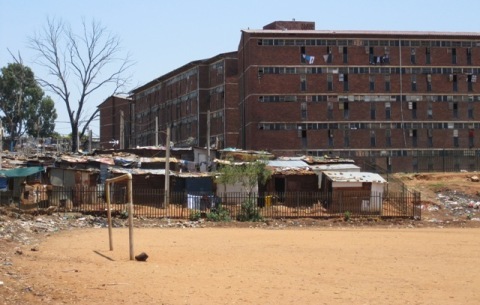 In Alexandra, the whole baseball project hinges on a handful of dedicated guys who work odd jobs to have a bit spare cash which they then funnel back to their kids to keep the team going from week to week. 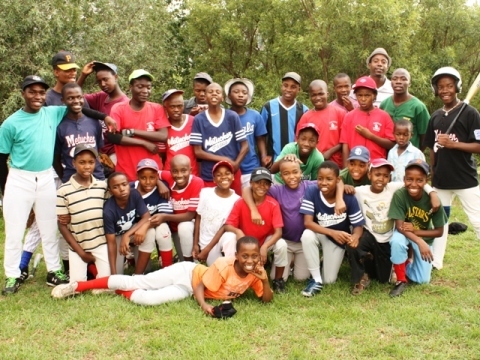 They try to get their hands on used equipment (even with enough money not an easy thing here in South Africa where no sports store carries baseball stuff) so that they can entice new kids into their club. 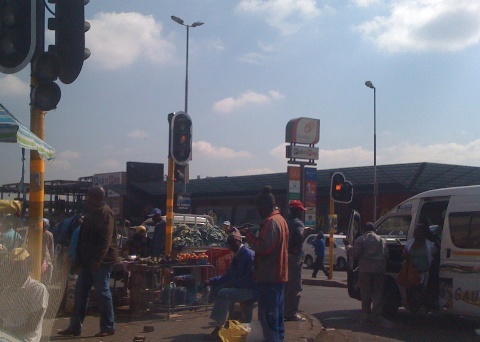 They spend their spare time rounding up kids who will walk many kilometers (you don’t see many overweight people in Alexandra!) just to attend practice. What cash they’ve scraped together by pooling their own funds with what a few parents are able to contribute usually goes into transport for their weekend games. You see, no one owns a car, and the only mode of transport is to pile into a minibus taxi, way over the legal passenger limit, and hope that this particular one won’t be one of the many involved in an accident that day. 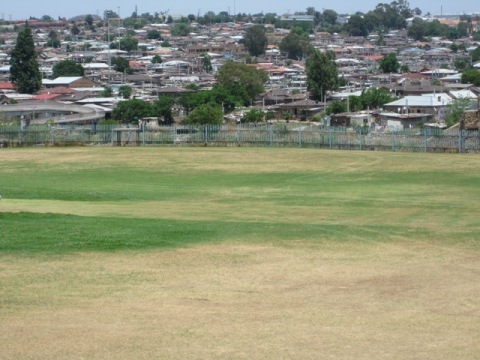 If they had their own field with a backstop, maybe at least some games could be played at home, cutting down on this transport expense, if in fact the other clubs could be enticed to brave a visit to Alexandra. On top of all that, Tedius and Cedric and some others have the vision of growing baseball so that it is played in the local schools, which means an entirely new league has to be created and administered. Nevertheless, Alexandra Baseball has survived and thrived for three years and, as someone here recently put it, will continue to do so “by the grace of God.” Thank you to all of you who’ve donated to our cause. The shipment of equipment is sailing to Durban as I’m writing this, and we got an unexpected gift of baseball pants, which I’ll be writing about next. 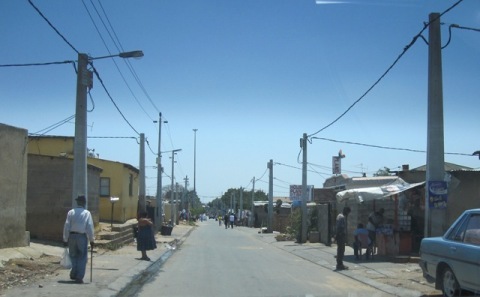 And by the way, my friends in Alexandra will probably be offended that I called it a “slum.” So let me just say here that there is plenty to love about Alexandra. There is a lot of poverty but also a lot of cheerfulness. There is also a sense of community you won’t find in our spread-out suburban estates. 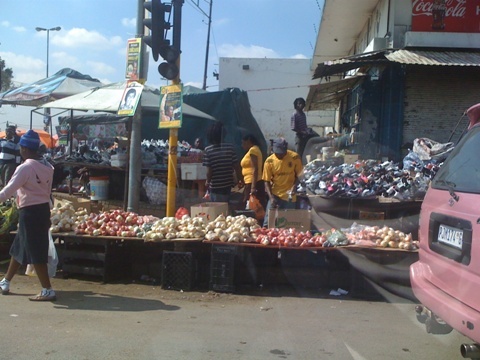 The streets are full of life, you have to veer around the occasional goat, and the hustle and bustle on every given day is mind-boggling. I’m very glad I’ve discovered it.